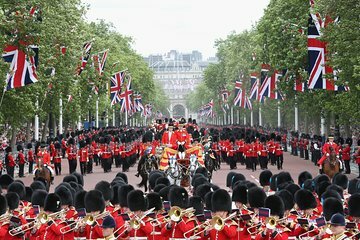 Scopri il patrimonio reale di Londra e assaggia le tradizionali specialità inglesi in questo tour gastronomico di 3,5 ore. Fai un tour a piedi dei Parchi Reali, Piccadilly Circus e St James Palace; guarda il Cambio delle Guardie a Buckingham Palace; e assaggiate la degustazione di formaggi, il tè del pomeriggio e altre specialità britanniche. My friend and I went on the Royal Food Tour on Tuesday, September 19, 2017 and we have a fantastic time. Our guide, Mr. Bond Kevin Bond is a very friendly, knowledgeable young man who took us around to the different stores, streets and places the Royal family goes to purchase their food, treats, drinks, clothes, hats, etc.- all within the neighborhood near and around Buckingham Palace. Since the rest of the group didnt show for the tour, my friend and I got a tour with just Mr. Bond and us. We started off with sweet rolls that the Queens eats every morning and we walked through the historic shopping arcades like the Royal Arcade and the Burlington Arcade where the Royals still shop. We visited the candy shops, grocer, cheese maker, liquor store, clothing stores and various places- tasting and learning along the way. We had Scotch eggs at Fortnum and Mason, candy at Charbonnel and Walker, 4 types of delicious cheeses at Paxton and Whitfield, superb gin at Berry Bros and Rudd and even a delicious vegetarian treat that was the favorite of Queen Victoria made for her by her favorite Indian friend who served her at Buckingham Palace. Our guide, Kevin, knew so much about the history of the places we visited, with great anecdotal stories like Tallulah Bankhead getting wasted at the Ritz Hotel Winston Churchill is my god!, or Ian Fleming having his martinis shaken, not stirred at the Duke Hotel bar while writing James Bond novels, or John Lennon meeting Yoko Ono for the first time at an art gallery in Masons Yard, home of rock and roll in London. Kevin really brought the Royals to life- both past and present. 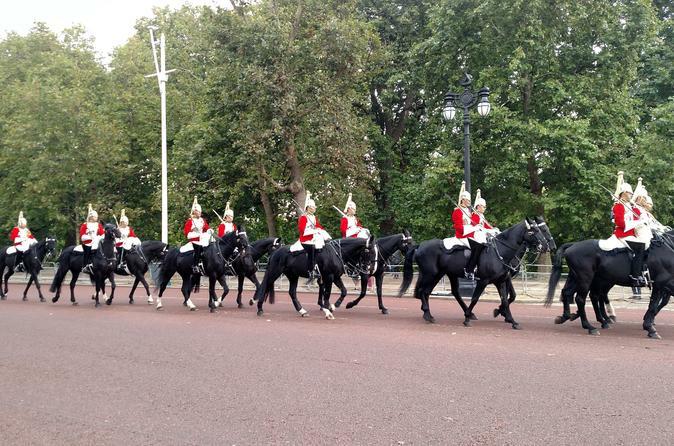 We went over to Buckingham Palace for the Changing of the Guards, but the guards didnt change. Instead the Royal Calvary rode in, which was really nice. Folks still love the pomp and circumstance. As we walked around, Kevin pointed out the blue plaques on buildings that commemorated a special person or event that happened in that spot passed by where Napoleon lived for a while in London and Churchills house, among others. We walked on side streets like the Crown Passage and Masons Yard and alleys that I would have never gone on my own. That made the tour extra special for me and my friend. In the end, we had afternoon tea at Richoux, a lovely spot on Piccadilly. That is where we ended our tour, in an elegant and very English way. Thanks to Kevin Bond and his engaging and fun guidance, I learned a lot about the Royals, about upper class London and all the great food that London has to offer. This tour is a MUST and a highlight for a visit to London. This is a tour everyone should make time to do. We really enjoyed the range of tastings that were provided but also the history of many of the suppliers and their connection with the Royal Household. It was a great day discovering some of the lesser known spots round that area of London but also seeing some of the Royal Palaces and in our case the bonus of a Changing of the Guard ceremony going on which was great to see. Many thanks to Kevin our tour guide who kept us well entertained and had an interesting fund of stories and facts about the history of the area and its food. Make sure you feel like eating before you go on this tour because you get through quite a few samples and we certainly felt well satisfied by the end of the tour. Overall very good value and a really enjoyable day out. Fantastic tour and certainly one not to be missed! Everyone in our group thoroughly enjoyed themselves and as there was such a wide age-range we have to say a huge - well done. We tasted a great variety of foods that London has to offer and also learnt many interesting facts and stories too from our guide who was fantastic, very knowledgeable and made the whole day great fun for us. If you're visiting London then this comes highly recommended - you won't be disappointed - we had a great time. Big tip - start this tour with a good appetite as there's plenty of delicious food to eat ! Next time we're in London we will definitely be booking another tour with you guys. Thanks for a great tour and for a memorable day in London. We really enjoyed the whole experience. The royal food tour was an amazing experience, the best day I had in London during my stay! I felt like a princess during the whole tour. We did an amazing, really informative cheese tasting in a wonderful old cheese shop who still supply the royal family with their cheese weekly. I saw lots of great things like the changing of the guards, where the sandwich was invented, the bar that invented James Bond's martini and tasted luxury chocolates, fruit's, pastries, meats drinks and even had afternoon tea in a beautiful, luxurious tea shop frequented by the queen. I would be happy to rate ten stars if that was possible, they really deserve it! Kevin the guide was absolutely charming, he knows his stuff really well and I left the tour knowing everything and more that I could possibly want for the rest of my week in London. Next time I'll be in London I will come back to see their other tours and maybe even do this one again, it was that good.